This is a view of our street from the Cul-de-sac. We liked the spread out, yet formal nature of the neighborhood and the attention to open spaces provided. When you select your neighborhood you will have extremes to choose from. Some neighborhoods are populated by town-houses which are in our opinion a step up from apartments, but the attachment to your neighbors will offer some challenges as time progresses. Some neighborhoods are built with only a token amount of land with barely enough space between each house to tote a lawn mower and semi-private back-yards that connect. 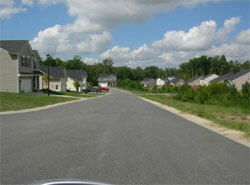 Our neighborhood involves lots generally ½ acre in size with a generous amount of land between each home. Finally, some prestigious or large home sites offer acreage, at a premium price. It is all personal preference, as we know many people happy in a condo in an inner city tower, as well as those on 1600 acre farms. There is no one size fits all building site, but you do have options for almost any budget. Buying a plat of land is a very serious decision. It involves a lot of thinking and a large amount of money. These days, it is not wise to buy something without taking important factors into consideration. So, before you pay for the land, make sure that you determine its value for financing purposes. Also, see to it that you do not pay higher than you should. You need to figure out its value and compare it with other plats of land. Numerous factors influence the value of land. Most people believe that location is a very important factor. Even though this is true, location is not the only thing that you need to take note of. Zoning regulations, for instance, can increase or decrease the value of land. If you want to accurately determine the value of a plat of land, you should look beyond tax rolls. Make use of recent sales listings of comparable properties in order to determine the value of the plat of land. Search for properties of similar location and size, so you can have a good comparison. Verify which property has an amenity and which one does not. In order for you to know the value of the other land, subtract the value of the amenity from the price of the comparable property. You should also research the history of the land. Depending on the location and condition, the historical value of the land can add to its sale price. Plats of land that are designated as landmarks are usually monitored by landmark preservation agencies; so in case there are changes that need to be made on the land, the landmark preservation agency should be notified. This can be quite a hassle, and may decrease the sale price of the land. Zoning regulations are significant factors to consider because they determine how the plat of land can be used, which structures are allowed to be built, and what sizes these structures need to be. Typically, vacant lots that are commercially zoned businesses and for high-rise apartment buildings are more expensive than vacant lots zoned for residential housing. Make sure to speak with the local authorities before you decide to pay for the plat of land. You should ask about future zoning and find out if there are plans for airports and other structures to be constructed. Access to various amenities such as schools, offices, and other establishments influences the value of the land, as well. If it is nearer to banks, supermarkets, educational institutions, hospitals, and commercial establishments, chances are it is priced with a high amount. This is usually the case; so do not readily give in when you hear that a plat of land is being sold for a very low price. Always think of the possible reasons why it is priced like that. You should also consider the topographical and geographical conditions in the area. These factors greatly influence the value of a land as well as its costs for maintenance. Typically, owners of plats of land in floodplains need additional insurance policies because erosions and varying weather patterns commonly affect floodplain boundaries. In addition, you should research about any upcoming projects in the area. Newly constructed highways, stadiums, or parks can either increase or decrease the value of the land. Furthermore, you need to get an appraisal from a real estate appraiser, so you can come up with an accurate value for the plat of land. Views of rivers and lakes will add value to a plat of land. If you are interested in building on land with a great view, you need to be prepared to pay more for the land. If you do not find value in a view, it may be a good idea to skip those pieces of land, as they will not suit your wants and needs and you will pay more for them than a piece of land that may be more useful to you. No matter what the case, when you are purchasing a piece of land, you should be sure of what features you want before you begin to look. You should make sure all amenities that will be necessary for you to live are nearby. You should also make sure the property is zoned according to your needs. Buying a piece of land is an investment, make certain you take it slow and make wise decisions before you make your final choice.